With a wide variety of spectacular and diverse east-facing views, I can think of no better place to photograph a moonrise than Yosemite. I especially like the December full moon because it aligns so well with Half Dome, not just on the night it’s full, but on the nights leading up to the full moon. When I realized that this year’s December full moon was so close to Christmas, I almost didn’t schedule my annual Yosemite Winter Moon workshop, but then I figured that since I’ll be there anyway, I may as well. I’m so glad I did—the workshop filled, and the skies were clear enough (never a sure thing in December) that we photographed the moon on three of the workshop’s four nights, culminating in a very special moonrise to wrap up the workshop (a topic for a future blog post). The closer it is to full, the closer to sunset the moon rises, arriving several hours before sunset a few days before it’s full, then a little later each evening before rising right around sunset on the full moon day. Since a waxing (increasing in fullness) moon is always higher at sunset than it will be the next day, with a little planning, it’s possible to time several consecutive days’ shoots to coincide with the moon rising right around sunset. For this year’s workshop I’d planned three sunset moonrises for my group, each (more or less) aligning the moon and Half Dome, getting farther from Half Dome each day. While the first of my planned moonrise shoots was Wednesday, when the moon rose above the flat horizon about two hours before sunset, the horizon in Yosemite is anything but flat. I took my group to a favorite location beside the Merced River on Yosemite Valley’s east side, less than three miles from Half Dome, where the relatively steep view angle to the top of Half Dome means that it takes the moon a couple of hours to climb into view here. Though not labeled on the map, this spot isn’t a secret to photographers, so I arrived about 45 minutes early, partly to allow everyone time to prepare, but also to ensure that we wouldn’t need to battle anyone else for position. I told everyone that the moon would appear at around 4:30 from directly above the top of Half Dome, and suggested that they be ready with their compositions beforehand. I never tire of seeing the glow of the moon’s leading edge peak above the horizon, and this evening was no exception. When the moon nudged into view, the sounds of chatter and laughter were instantly replaced by clicking shutters. Watching the moon grow in my viewfinder, I adjusted my composition slightly before each click. When the moon gained separation from the granite to become fully visible, I panned slowly to the right and saw that with the right framing it would appear nestled into a subtle bowl-shaped curve atop Half Dome and locked in a composition that would last for a few minutes as the moon continued its ascent. A thin wisp of cloud scooted through the scene as I clicked this frame, lit by the day’s final rays. Looking at the distant world at 800mm reveals previous invisible detail. So once I’d settled on a composition that I could stick with for a few clicks, I allowed my eye wander the frame and noticed dangling icicles lining Half Dome’s rim. I continue to be blown away by the sharpness of the Sony 100-400; not only is this lens unbelievably sharp, I literally cannot tell a difference when I pair it with the Sony 2X teleconverter. Much of my photography is about juxtaposition of elements with the landscape. Sometimes that’s simply combining static terrestrial features, but when possible I try to add something more dynamic, such as meteorological subjects like lightning or a rainbow, or celestial objects like the Milky Way or the Moon. The challenge with dynamic juxtapositions is timing—while the meteorological juxtapositions are usually a matter of playing the odds, celestial juxtapositions are gloriously precise. Just as the Earth revolves around the Sun, the Moon revolves around Earth; at any point in this celestial dance, half of Earth is daylight and half is night, while half of the Moon is lit and half is dark. The amount of the Moon we see (its phase) depends on the relative position of the Sun, Moon, and Earth in this dance, and once each month all of the sunlit side of the Moon faces the dark side of Earth, and we Earthlings enjoy a full Moon. This alignment of three or more orbiting celestial bodies necessary for a full (and new) Moon is called ‘syzygy.’ Due to the Moon’s orbit around Earth, the Sun, Earth, and Moon achieve syzygy twice each lunar month: once when the Moon is between the Sun and Earth (a new Moon), and again when Earth is between the Sun and Moon (a full Moon). The Moon completes its trip around Earth every 27.3 days, but it takes 29.5 days to cycle through all its phases, from new to full and back to new again. The Moon’s phases need that extra 2+ days because as the Moon circles Earth, Earth also circles the Sun, taking the syzygy point with it—imagine a race with a moving finish line. Viewed from Earth, the Sun and Moon are on opposite sides of the sky when the Moon is full, so a full Moon rises in the east at sunset and sets in the west at sunrise. We rarely see a full Moon rising exactly as the Sun sets (or setting as the Sun rises) because: 1) the point of maximum fullness (when the Sun, Earth, and Moon align perfectly) only happens at one instant on the full Moon day—at every other instant of each month’s full Moon day, the Moon is merely almost full (but still full enough to appear full); 2) published Sun/Moon rise/set times assume a flat horizon—if you have mountains between you and the horizon, your view of the true Sun/Moon rise/set is blocked; and 3) The more extreme your latitude (angular distance from the equator), the more skewed the Sun/Moon alignment appears. Knowing this, it should make sense that the closer the Moon is to full, the longer it’s in the night sky, and a full Moon is in the sky all night long. Less intuitive but very important for lunar photographers to know, each day the Moon rises an average of 50 minutes later (between 30-70 minutes) than it rose the previous day—I usually mentally round to an hour for quick figuring. If the Moon orbited Earth on the same plane Earth orbits the Sun, we’d have an eclipse with each syzygy: every new Moon, Earth would pass through the Moon’s shadow and somewhere on Earth would experience a solar eclipse; every full Moon the night side of Earth would witness a lunar eclipse as the Moon passes into Earth’s shadow. But the Moon’s orbit is tilted about 5 degrees from Earth’s orbit, making the perfect alignment an eclipse requires relatively rare. It turns out that the alignment of the Sun, Earth, and Moon necessary for a lunar eclipse happens from two to four times each year. Of these, about one-third are total eclipses, when Earth’s shadow completely covers the Moon. At totality, most of the sunlight illuminating the Moon is blocked by Earth, and the only light to reach the Moon has passed through Earth’s atmosphere, which filters out all but the long, red wavelengths. For the same reason sunsets are red, during a total lunar eclipse we see a red or “blood” Moon. As frequent and familiar as the rise and set of the Moon is, the opportunity to witness the beauty of an eclipse is rare. But in the last six months, after being shut out by schedule or weather for many years, I’ve managed to photograph my first total solar and lunar eclipses. I wasn’t able to juxtapose the August solar eclipse with a favorite landscape, but I wasn’t going to let that happen again for last week’s lunar eclipse. Viewed from Death Valley’s Zabriskie Point in winter, the setting full Moon’s azimuth aligns nicely with Manly Beacon, one of the park’s most recognizable features. Though this year’s alignment was particularly good, the morning of the eclipse was a day earlier than I’d normally photograph the Zabriskie Point moonset—the next day the Moon would be setting about 45 minutes later, providing ample time to photograph the landscape in the warm early light before the Moon descended behind the Panamints. Nevertheless, I decided that a total lunar eclipse trumps everything, and since Zabriskie was the best place for the eclipse, that’s where we were. We started with telephoto compositions of the beautiful “blood Moon” phase because there wasn’t enough light to include the eclipsed Moon with the landscape without compositing two exposures. Composites are fine, but I prefer capturing scenes with one click. For wider images that included the landscape I waited until totality had passed, shortly before the Moon set, and switched to the Sony/Zeiss 24-70 with my Sony a7RIII, moving my Sony 100-400 GM to my Sony a7RII. I captured this image about 25 minutes before sunrise, normally too early to capture landscape detail without over exposing the Moon. But this morning, following the total eclipse, the lit portion of the moon was still darkened by Earth’s penumbral shadow, which reduced the dynamic range to something my cameras could handle. To enlarge the Moon and emphasize its juxtaposition with Manly Beacon, I went with the 100-400. With my composition and focus set, I slowly dialed up the shutter speed until I saw my a7RII’s pre-capture “zebra” highlight alert. After clicking I magnified my image preview and examined the moon to confirm that I did indeed still have detail. The foreground was quite dark on my LCD, but my histogram indicated the shadows were recoverable, something I later confirmed in Lightroom. I used to resist using the supermoon label because it’s more of a media event than an astronomical event, and it creates unrealistic expectations. But since the phenomenon appears to be with us to stay, I’ve changed my approach and decided to take advantage of the opportunity to educate and encourage. So just what is so “super” about a “supermoon?” Maybe another way of asking the question would be, if I hadn’t told you that the moon in this image is in fact a supermoon, would you be able to tell? Probably not. So what’s the big deal? And why do we see so many huge moon images every time there’s a supermoon? So many questions…. To understand what a supermoon is, you first have to understand that all orbiting celestial bodies travel in an ellipse, not a circle. That’s because, for two (or more) objects to have the gravitational relationship an orbit requires, each must have mass. And if they have mass, each has a gravitational influence on the other. Without getting too deep into the gravitational weeds, let’s just say that the mutual influence the earth and moon have on each other causes the moon’s orbit to deviate ever so slightly from the circle it seems to be (without precise measurement): an ellipse. And because an ellipse isn’t perfectly round, as it orbits earth, the moon’s distance from us depends its position in its orbit. An orbiting object’s closest approach to the center of its ellipse (and the object it orbits) is at “perigee”; its greatest distance from the ellipse’s center is “apogee.” And the time it takes an object to complete one revolution of its orbit is its “period.” For example, earth’s period is one year (365.25-ish days), while the moon’s period is a little more than 27 days. But if the moon reaches perigee every 27 days, why don’t we have a supermoon every month? That’s because we’ve also added “syzygy” to the supermoon definition. In addition to being a great Scrabble word, syzygy is the alignment of celestial bodies—in this case it’s the alignment of the sun, moon, and earth (not necessarily in that order). Not only does a supermoon need to be at perigee, it must also be syzygy. Syzygy happens twice each month, once when the moon is new (sun-moon-earth), and again when it’s full (sun-earth-moon). (While technically a supermoon can also be a new moon, the full moon that gets all the press because a new moon isn’t visible.) Since the earth revolves around the sun as the moon revolves around earth, the moon has to travel a couple extra days each month to achieve syzygy. That’s why the moon reaches perigee ever 27 days, but syzygy comes every 29.5 days, and the moon’s distance from earth is different each time syzygy is achieved. While perigee, apogee, and period are precise terms that can be measured to the microsecond, a supermoon is a non-scientific, media-fueled phenomenon loosely defined a moon that happens to be at or near perigee when it’s full. To you, the viewer, a full moon at perigee (the largest possible supermoon) will appear about 14% larger and 30% brighter than a full moon at the average distance. The rather arbitrary consensus definition of the distance that qualifies a moon as a supermoon is a full moon that is within 90 percent of its closest approach to earth. I really doubt that the average viewer could look up at even the largest possible supermoon and be certain that it’s different from an average moon. And all those mega-moon photos that confuse people into expecting a spectacular sight when there’s a supermoon? They’re either composites—a picture of a large moon inserted into a different scene—or long telephoto images. I don’t do composites, but they’re a creative choice that I’m fine with others doing as long as they’re clearly identified as composites. For an image that’s not a composite, the moon’s size in the frame is almost entirely a function of the focal length used. I have no idea whether most of the moons the full moon gallery below were super, average, or small. The images in this and my previous blog post were indeed super, taken within minutes of each other last Sunday evening, at completely different focal lengths. A rising or setting full moon is one of the most beautiful things in nature. But because a full moon rises around sunset and sets around sunrise, most people are eating dinner or sleeping, and seeing it is usually an accident. So maybe the best thing to come of the recent supermoon hype is that it’s gotten people out, cameras or not, to appreciate the beauty of a full moon. If you like what you saw (or photographed), mark your calendar for every full moon and make it a regular part of your life—you won’t be sorry. It was New Year’s Eve and I was perched on a cliff overlooking Yosemite Valley, two feet from certain death and ten minutes from the rise of the largest full moon of 2018. While the death thing would have only been a problem if I’d have lost my mind, the moon’s appearance was entirely subject to the whims of Nature. And at that moment, she wasn’t cooperating. The vast majority of my images are the result of a plan. But planning in nature requires both flexibility and resolve—an ability to adjust and persevere rather than quit when things don’t unfold as expected. The master plan for this trip was to photograph 2018’s largest moon twice, on opposite sides of the Sierra. I’d start with super-telephoto shots of the moon’s appearance above Yosemite Valley at sunset on December 31, then drive to Lone Pine (just 100 or so miles as the drone flies, but more than 350 miles as the car drives) to capture its disappearance behind Mt. Whitney at sunrise on January 2. Unfortunately, it seemed that each day leading up to my trip, the weather forecast for both locations trended worse. But moon or not, can you think of a better way to celebrate the New Year than circumnavigating the Sierra? Me neither. A beautiful scene is one part landscape and one part conditions (light, weather, and so on). We generally know where the great landscapes are, but finding them in the right conditions requires research, planning, and execution (plus a little luck). I try to time my trips, workshops and personal, to coincide with these special moments, usually some weather or celestial event. Whether it’s lightning at the Grand Canyon, the Milky Way above Kilauea or the bristlecone pines, or a moon rising or setting behind Half Dome or Mt. Whitney, I want to be there. The problem is, nothing in nature is guaranteed. We know to the microsecond where the sun, moon, and stars will be at any given time, but have no way of knowing what weather we’ll encounter. I’ve lost many a shoot to inconveniently placed clouds, and I’ll never forget the time I scheduled an entire Yosemite workshop based on the anticipated arrival of Comet ISON, only to have the comet go all Icarus on me just days before the workshop. But experience has taught me that regardless of the score you don’t leave the game until the last out, and you don’t cancel just because the odds are against you. Sometime the odds are wrong, and sometimes I end up getting an unexpected gift that feels like a reward for my persistence. One of the most memorable shoots of my life happened on a morning with clear skies forecast, but we ignored the forecast and went out for sunrise anyway. 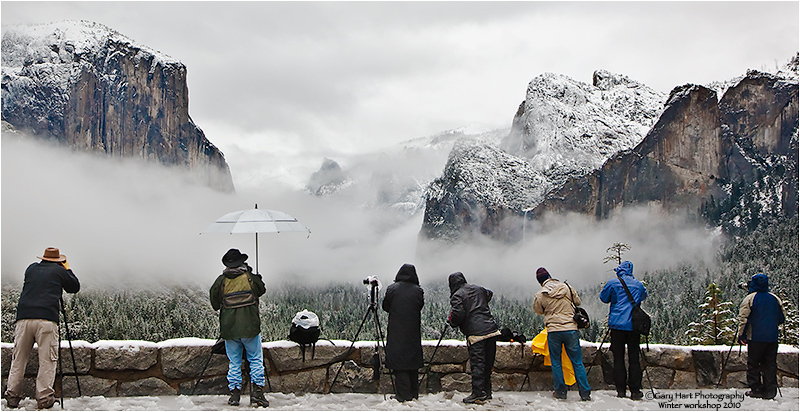 And I ended up getting the last laugh on the ISON workshop when Yosemite Valley became the beneficiary of a snowstorm and sudden cold that coated every exposed surface in sparkling ice crystals. It turns out that my Sierra circumnavigation didn’t yield the big moon images I’d planned, but it definitely delivered in many ways. Ignoring the clouds, I arrived in Yosemite Valley on New Year’s Eve afternoon and ended up at my chosen location at around 4:00 p.m. The sky was mostly clouds, but a few patches of blue in the east gave me reason to hope. The spot I’d chosen was indeed on a cliff 300 vertical feet above Yosemite Valley, but it was only dangerous if I wasn’t paying attention to what I was doing, and given my relationship with heights, there was little chance of that. Flanked by two tripods, I kept one eye on the horizon and the other on void at my feet. On my big tripod (RRS TVC-24LS) was my Sony a7RIII and 100-400 GM with a 2x teleconverter; on my compact tripod (RRS TQC-14) was my Sony a7RII and 70-200 f/4. Each tripod had one leg about two inches from the edge and two legs in the shrubs at my back. Me? I had two legs firmly planted on the narrow granite shelf, with my backside hugging the shrubs. Sunset was at 4:50. With a cloudless sky the moon would appear from behind Cloud’s Rest at around 4:30, a location similar to last month’s full moon but closer to El Capitan. I’d hoped to start the moonrise with a long telephoto, then transition wider as it rose, but by 4:20 the persistent clouds made it pretty likely that if I saw the moon at all, it would be well above Cloud’s Rest and too high for a telephoto shot. At around 4:30 I waved a white flag at the big moon idea and replaced the 100-400 lens with my Sony/Zeiss 24-70 f/4, hopeful that the moon would make its way into a gap in the clouds before the sky became too dark. At around 4:45 the moon teased with a brief appearance between the clouds, but they scissored shut before the moon had an opportunity to shine. While waiting I worked on my revised composition, which was complicated by my desire to include with the distant moon and Yosemite Valley, a dead tree in my immediate foreground. With very little margin for depth of field error, I opened my hyperfocal app and plugged in the numbers to determine the f-stop and focus point that would ensure front-to-back sharpness. 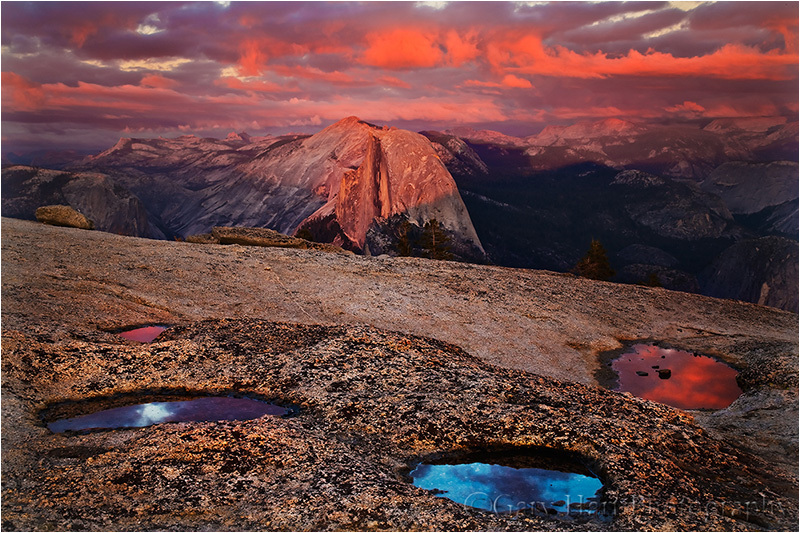 With that out of the way, I bided my time photographing beautiful warm light on El Capitan and Half Dome. The moon finally peeked above the clouds for good at 4:48. Ascending the darkening sky, the moon was enhanced by a sheer film of nearly transparent clouds that started out pink that intensified to fuchsia on their way to a vivid magenta that colored all of Yosemite Valley. I kept clicking as the foreground darkened, magnifying my image periodically to be sure I wasn’t losing detail in the moon. The image I share here was captured fifteen minutes after sunset. The Lone Pine segment of my trip was a photographic flop, but photography really shouldn’t be all about the photography. I arrived in Lone Pine mid-afternoon on New Year’s Day and spent the remaining daylight doing reconnaissance for the next day’s sunrise moonset. This was going to be another super-telephoto opportunity, this time at a location I’d driven past but never photographed from, so I wanted to ensure no surprises. That afternoon I enjoyed nice clouds and light above the Sierra’s east face, but to have photographed it would have compromised my scouting objective so I was just content to enjoy. I rose before 6:00 a.m. on January 2 and drove out to my planned location with a pretty good idea that the clouds would shut me down. When I parked, the moon penetrated the clouds as an indistinct glowing sphere. As I waited, it descended into more-dense clouds and disappeared for good, but I stayed, quite content to simply watch Mt. Whitney and its towering neighbors emerge beneath the brightening sky. The drive home took my beneath the serrated Sierra crest, past Mono Lake, through the Hope Valley, over Echo Summit and back down into Sacramento, completing the circuit with at least one successful image and many memories of a great trip. A very Happy New Year indeed. Want to totally confuse your camera? Try metering a scene like this.